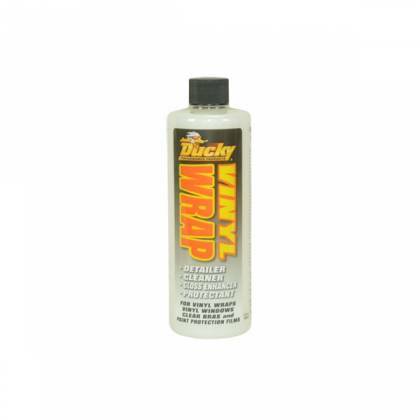 The Ducky Vinyl Wrap is for all vinyl wrapped vehicles, boats, trailers etc. It cleans, conditions and protects the wrap. It will leave your wrap with a smooth to the touch high gloss finish. Vinyl Wrap goes on slick preventing the possibility of scratching surface while effectively cleaning dirt, grime and airborne contaminants. Vinyl Wrap promotes longevity and clarity while protecting against harmful UV rays that dull, fade and dry out Vinyl Wraps, Vinyl Windows, Clear Bras and Paint Protection Films. It can be used after or between regular washes and is also great as a waterless wash. Excellent for use on paint, plastic, clear coat, fiberglass and metal.